After another cozy evening at Walmart, I set out to try blueberry coffee. When I saw the option for the first time, I thought, GROSS, but after second thoughts, I’m in Maine, and I should at least try it. I didn’t find any at Rockland Café, but I did enjoy a bacon, egg, and toast breakfast at a local joint before dropping the geocoin in a cache near a JCPenney parking lot. I picked up another coin to drop elsewhere and then ventured to the Rockland Breakwater Lighthous on the Maine coast. The lighthouse station is on a 7/8 mile long breakwater that was built of granite in the late 1800s to protect the harbor. The Bodwell Granite Company used over 700,000 tons of granite at a cost of over $750,000. During the construction, a small beacon was moved each time the breakwater was extended. In 1902, a permanent lighthouse was built, and it was automated in 1965. After the Coast Guard announced they planned to destroy the structure, and the City of Rockland rebuked the property, the nearby Samoset Resort cared for the building until 1989. Thereafter, the City has preserved the lighthouse under the Maine Lights Program. According to Kate and Lucy, who I met on the breakwater, Kenny Chesney was here yesterday filming, so watch for a movie or video with this lighthouse in the background! Kate is a full-time resident nearby and works at a recycling center. I watched a “How Do They Do That” show on television once on recycling, it is fascinating. Kate tells me the most sought after plastic container is the milk jug. Lucy is originally from San Antonio, Texas and also lived in Midland while she taught art. Now she spends five months in Maine and the rest of the year in Tucson. Hopefully I’ll run into her again when I’m visiting my Aunt Diane and Uncle Mike in Arizona. They both suggested I visit Port Clyde and the Marshall Point Lighthouse. As such, I continued southwest along the Maine Coast. Port Clyde is where Andrew Wyeth, the American painter, spent many summers as a child. There is a “no-autos allowed” ferry from Port Clyde to Monhegan Island 12 miles offshore that is abound with nature trails. I imagine it would take the ferry an hour or two to travel 12 miles, so I’ll have to come back another time as that sounds like a good day trip. 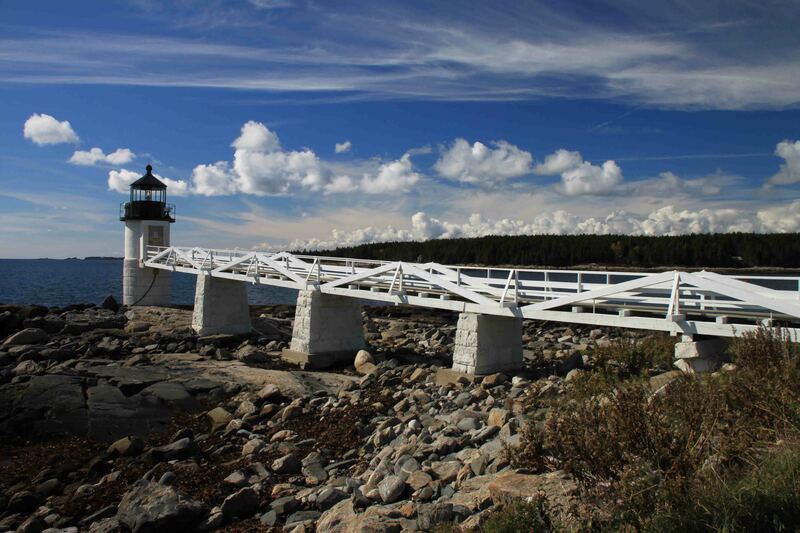 The Marshall Point Lighthouse on the Maine coast was featured in Forrest Gump. It was the last place Tom Hanks ran to before turning around. Kate and Lucy told me when the lighthouse needed to be refurbished, a fundraiser was held and parts of the planks that Tom Hanks stood on were sold for $5 a piece! After visiting Port Clyde, I stopped off in Waldoboro to try the famous pie at Moody’s Diner. I wasn’t even hungry, but a handful of people mentioned the diner, so I couldn’t pass it up. The diner serves a nice, big slice! Also, a cache was hidden nearby, so I dropped the geocoin I found in Rockland at the “Feeling Moody” cache in Waldoboro. The ammo can included a handful of items, one being a Texas Challenge Geocoin that started out in Fredericksburg in 2009. It has made its journey northeast to Maine, so I think I’ll bring it down south a bit. I noticed another cache called “A Popular Hangout Back in 1819” was located only 0.2 miles away. Given the title, I assumed it was some sort of historic site, so a quick detour brought me to the Town Pound that was the first permanent structure in Waldoboro to enclose stray horses, sheep and cattle. This is one of the reasons why I love geocaching. It takes me to places I would have never seen otherwise, and the “corral” was cool! After stopping at the pound, I drove through Damariscotta where it appeared the local businesses have a pumpkin decorating contest…lady bugs, birds, cars, and other artistic pumpkins lined the main street. In addition, I saw a second Rexall Drug. I forgot to mention that I saw one the other day. I guess I was wrong when I blogged the first week that I thought they went out of business. As I was entering Wiscasset, I spotted a historic site marker near Damariscotta for a fort. Fort Edgecomb was built in 1808 and housed 20-35 troops until 1816. During tensions with England, instead of declaring war, Thomas Jefferson ordered to enhance the nation’s defense by building coastal forts. Fort Edgecomb was one of nine fortifications. Waterfront earthwork batteries protected the canons. All was quiet after 1816 until the Civil War. Volunteers manned the fort while the Confederate cruiser Tallahassee was in Maine waters raiding the Union’s commercial fishing fleet. I wasn’t expecting to see a wood fort. It was neat. No one was there, so the dogs got to frolic around the three acres while I looked for a micro geocache in the fence nearby. After the visit to the fort, I crossed the harbor bridge and stopped at Sprague’s Lobster…finally a lobster shack by the harbor that was open! I still wasn’t that hungry, but today was all about eating! I ordered clam fritters and met John and Tea who were admiring VANilla. John and Tea were from Baltimore and spending a few weeks camping in New England. They gave me several tips of places to camp in Arizona and Mississippi! Your trip is full of surprises and inspiration. Can’t wait to visit Ft. Edgecomb and some of your other discoveries. Will be thinking good thoughts for you and your sweet dogs. Kate and I will continue to follow your travels. So glad you checked out my blog. You gave me the interesting material with all the famous people. I really enjoyed meeting you guys. Stay in touch and let me know if your travels will cross my path! What flavor pie did you choose?